Paul Calle Hand Numbered Fine Art Giclée Canvas:"And A Good Book for Company"
Size: 21" x 16" and 29" x 22"
Edition: Limited to 100/50 with COA. About the Artist : Paul Calle was a master of both the oil painting and the pencil drawing. His drawings - often very large - showed incredible control and sensitivity; they had the quality of fine etchings. Few contemporary artists had attained greater mastery of the pencil than Calle, who shared his skills in his book, The Pencil, a record of his odyssey as "an artist with a pencil." It has been translated into French, Chinese and Russian. Calle's oil paintings, finely detailed panoramic landscapes of the majestic West, often took several years to complete. Another book of his art, Paul Calle: An Artist's Journey was awarded the prestigious Benjamin Franklin Award for Fine Arts in 1993. Here was an Artist whose career strongly reflected the dramatic era in which he lived and worked. Paul lived in Connecticut, but when he was chairman of the Department of Interior's 'Artist in the Parks' program, Paul traveled widely throughout the West. According to Paul, "The portrayal of Western Art is not a romantic adventure, but a realistic challenge - a personal commitment to portray America's past." Calle‘s magnificent art portrayed the human spirit, paying tribute to the trailblazers. Whether it was the first astronauts or those largely forgotten and unsung heroes, the North American trappers of the early 1800's. These were the men who blazed trails through mountains, navigated unnamed rivers, and trapped in lonely streams and meadows. 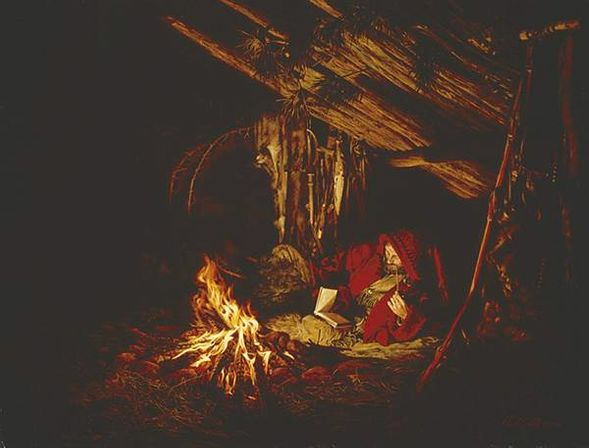 Despite their rough existence, they carried the Bible and Shakespeare with them to read around the campfire at day's end. They lived solitary lives, and most of them died unknown, before the age of 35, with records of their exploits, discoveries and stories unrecorded. The style of Calle celebrated their quiet courage and rugged dignity amid the frontier wilderness. Not only was he able to envision how scenes from their lives might have looked, but he rendered his visions with elaborate detail and historical accuracy. His art filled a void in our visual history. With his pencils and his oils, he captured scenes that preceded film, with results that no camera could ever duplicate. NASA recognized Calle‘s unique ability to interpret history. In the sixties, he was commissioned to document America's early space missions. Millions witnessed those historic moments when man first set foot on the moon. They watched as shadowy black-and-white images of the astronauts bobbed across their televisions in 1969. But with his mind's eye, Calle saw the moment in color. His painting, "The Great Moment" conveys its magnitude, capturing not only the image, but the emotion as well. He chronicled many behind the scenes space launch images and captured for posterity artistic interpretations of the events to give a human touch to the mechanical photos and video. He was the only artist allowed to shadow the Apollo 11 crew on the morning of their launch of this historic flight, resulting in a portfolio the cameras never saw. Calle painted man in relation to his environment, moments when man pauses, alone, to consider his surroundings. "The faces tell the story," he said. Like a good book, the art of Paul Calle draws you in, to experience the moment. "My paintings convey a certain period of history. Collectors tell me that they feel that they could be there; that they could be sitting around the campfire in 'Fireside Companions' or in the scene with 'The Storyteller of the Mountains'. They're buying an emotional feeling. I convey what I see, and it attracts them to my work." His painstaking attention to detail involved hours of research, collecting historic artifacts and retracing the footsteps of his subjects, all before committing the scene to pencil on paper or oil on panel. Still, Calle, a disciplined artist and a perfectionist, was never completely satisfied with his spectacular results.